Besides having perhaps the best rhyming name ever, Aki Kaurism�ki, the bad boy of Finnish cinema, also makes superlative pictures. BAM is doing a series on his films starting this weekend ("Kaurasm�ki Goes America", July 10-27) and if you've never seen at least one, Cinecultist urges you to head over to Brooklyn for a screening. Imagine the deadpan wit of Preston Sturges mixed with the social/class awareness of Ken Loach and you have a glimmer of the brilliant places that Kaurism�ki's films takes you. Last fall at the New York Film Festival, CC was excited to both see Kaurism�ki's newest, The Man Without a Past, and to listen to him answer some pretentious New York film people's questions afterwards. Unfortunately, the director did not attend with his film, sending a letter instead which protested the US government's refusal to grant a visa to fellow director from Iran, Abbas Kiarostami. Wow, CC thought, a political activist and a great filmmaker. Later, CC heard from critic Dennis Dermondy of Paper mag that actually Kaurism�ki had been too drunk/hung over to get on the plane to come to New York and sent this mocking letter instead. Hilarious. 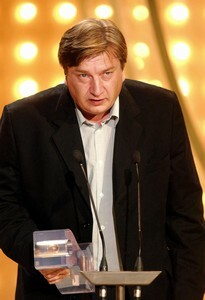 The above picture is of the director accepting an award at the San Sebastian film festival. Be sure to check out at least one film with his muse actress, Kati Outinen, she's particularly wonderful out of his cast of regulars.